>a while back i had a really lenghthy conversation about short term missions and just how successful they really are. are they effective? are they the popular thing to do? it’s encouraging to hear that i’m not the only one thinking it. its even more encouraging to read a blog with thorough answers to these questions. “Are short-term missions becoming faddish? That’s a rhetorical question. The answer is: YES. I estimate that 75% of STMs are done poorly (that is, not meeting many of the standards of excellence referred to below). Robert Priest estimates that as many as four million a year go on STMs. You do the math on the waste there. sometimes i get the vibe that people go on missions because they should. not because they’re called to go or because they truly have a heart for the work they’re doing there, but simply because they know its the right thing for Christians to do. especially teen and college Christian groups. this mindset boasts a lack of passion, prayer, effort, and ultimately a lack of change. now this doesnt mean God still can’t work through this, but is it worth the money we’re spending? withthe list o’ lacks above it’s likely that just donating that money to something would perhaps be more effective? i don’t know. i guess i’m alluding to the “waste” that barnes mentions in that quote. are short term missions becoming faddish? the case for short-term missions. what does an excellent missions project look like? i’m finding STMs more and more intriguing (both the pros and cons). they’re definitely necessary. and they’ve definitely changed the world. i hope this continues to be the case more often than 25% of the time. i’ve been on both sides of the percentage – maybe you have too. just thoughts. check those blogs and talk to me about them. maybe we can involve coffee too. oh last thing. 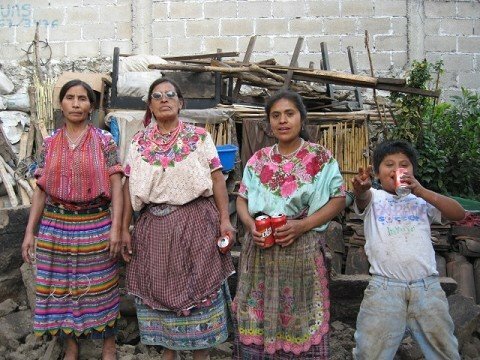 i copped this picture of three guatemalan women from one of the other blogs. check the kid on the right. i laugh out loud every time i glance. the best. hahahah. >Hey Adam!! !When i went to Urbana with Ichthus last year we discussed this… It’s so hard, you know? Especially medical missions too. It has to do with that quote, about the fish, you know… give a man a fish feed him for a day, teach him how, feed him for a lifetime. i mean that sucked paraphrasing, but it just normally doesn’t work. Instead we need people to go over there, educate people in how to take care of themselves and getting to the source of issues…i don’t know. It’s tough to think about! But, good post! Previous Previous post: >march madness: final four edition. Next Next post: >open letter to kanye west.